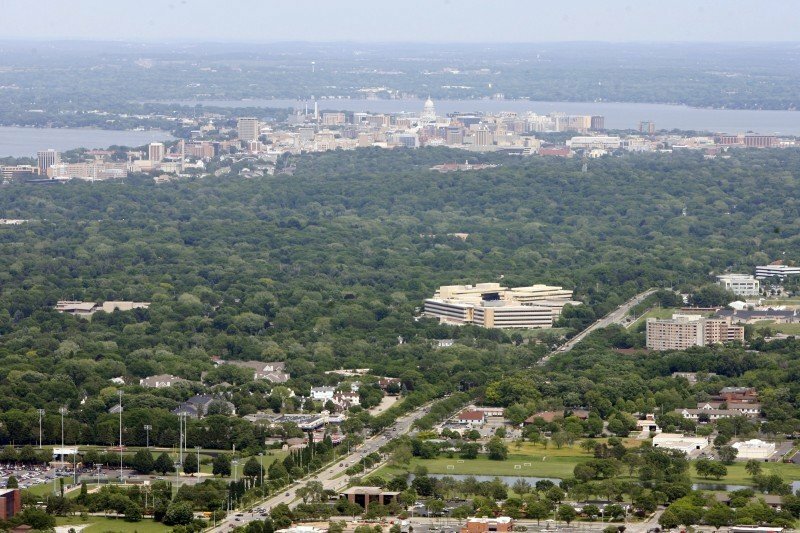 A view from the Madison Community Tower located off of Mineral Point Road shows the state Capitol and Downtown between Lake Mendota and Lake Monona, along with the CUNA Mutual campus rising prominently out of the trees along Mineral Point Road. The fear doesn’t come standing 1,310 feet above Madison and just a few yards from powerful TV antennas that can cook you from the inside like a microwave oven. Exhilarating describes the feeling of looking through the steel grated floor and matchbox size cars on the gravel driveway below. The views of Blue Mound State Park and the Baraboo Hills and the bird’s-eye view of the Madison skyline and its signature lakes are breathtaking. The feeling of doom actually begins near the bottom of the 1,423-foot Madison Community Tower, which can be seen for miles from its location near the corner of Mineral Point Road and Highway M on the Far West Side. The tower’s coffin-sized elevator can barely hold three people, sounds like a bad carnival ride and starts with jerking motions. The ride eventually smooths to something a little closer to a really bad office elevator, but then your ears begin to clog around 700 feet. When you step off at your destination about 100 stories up, watch yourself. There’s a 2-foot gap between the elevator floor and the tower’s observation platform that must be carefully crossed. Misstep at this Secret Place and the trip down is quick and final. Put this 660 tons of steel and guy wires next to the tallest buildings ever constructed and it would be ranked ninth in the world, just between the 1,451-foot-tall, 108-story Willis (formerly Sears) Tower and the 1,389-foot- tall, 98-story Trump International Hotel & Tower, both in Chicago, according to the Council on Tall Buildings and Urban Habitat based at the Illinois Institute of Technology, also in Chicago. 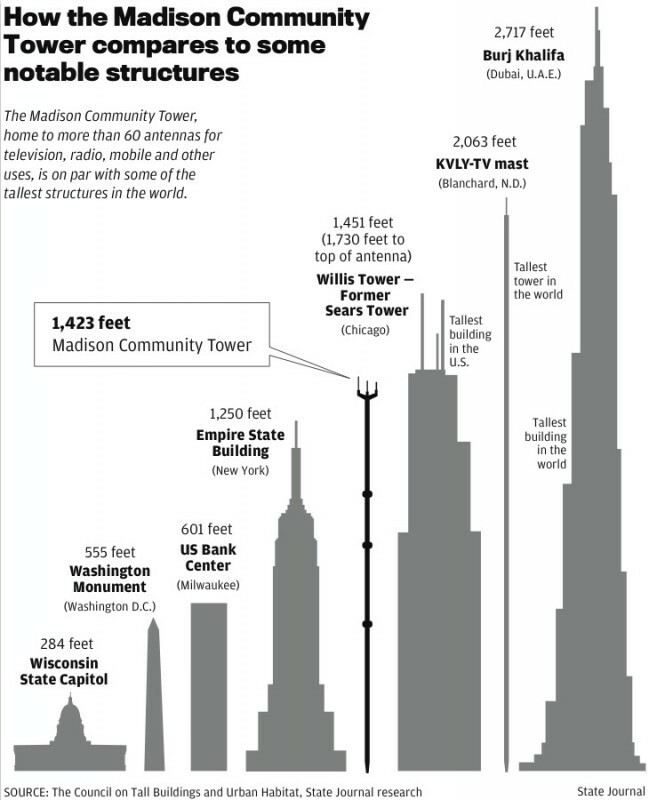 The Madison Community Tower with its antennas is taller than the Empire State Building (1,250 feet) and is one of the tallest structures in Wisconsin. The state’s tallest building is the 42-floor, 601-foot-tall U.S. Bank Center in Milwaukee. The WMTV-TV (Ch. 15) tower along the Beltline in Madison is 1,248 feet while WEAU-TV in Eau Claire has a 2,000-foot tower. Neither tower has an elevator, and that makes the Madison Community Tower elevator, which is state inspected, the highest in the state. There are about 60 broadcast towers around the country taller than the Madison tower, Wood said. The highest, at 2,062 feet, is located near Fargo, N.D., according to Wood. The elevator in the Madison tower is about three feet by four feet wide. There are no buttons assigned to floors, only up and down buttons. For the few who ever ride this elevator, mostly engineers who work on the tower, a leather harness with clips is required to be worn, just in case the elevator stalls, which it never has for Wood. The climb down on a built-in ladder from the top would take about an hour, he said. The tower, completed in 1995 at a cost of $10 million, was constructed to reduce the number of towers needed on Madison’s skyline. It is owned by the UW Board of Regents and managed by the UW-Madison University Research Park. Its elevator isn’t the only secret on this massive puzzle of steel. Its most noticeable attachments are LED beacon lights to warn aircraft. But the purpose of the tower is to bring the Simpsons and Led Zeppelin to you, snow plows to your street and an ambulance when you break your leg. 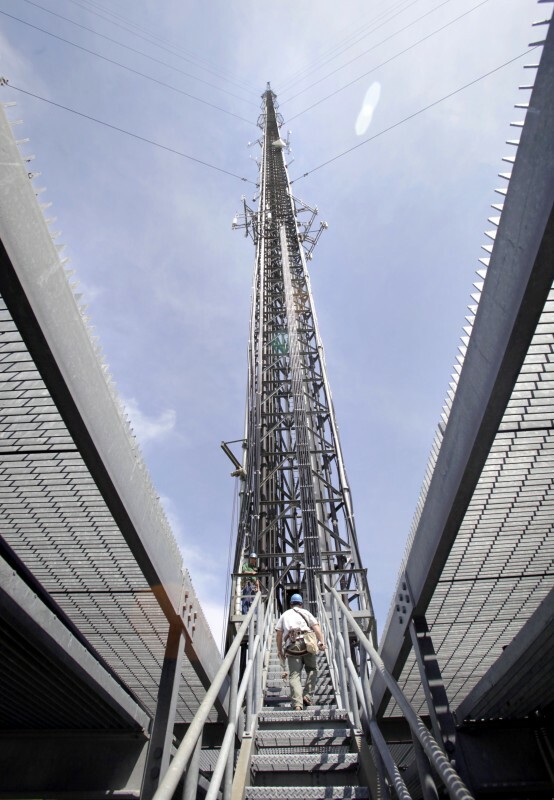 The tower holds more than 60 antennas for TV and radio stations, cellular phone companies and emergency services, public works and other government agencies. Most of the antennas, including WIBA-FM (101.5) and WERN-FM (88.7), are attached to the sides of the tower, but four Madison TV stations, WHA-TV (Ch. 21), WISC-TV (Ch. 3), WKOW-TV (Ch. 27) and WMSN-TV (Ch. 47), make up three orange-colored candlesticks ranging in height from 55 to 70 each and weighing from 10 to 20 tons. Wood, 58, started fixing electronics at his college radio station in Lake Forest, Ill., after he ditched the idea of becoming a psychologist. He spent years building towers but now travels the country for his Cottage Grove-based company, Resonant Results, providing antenna troubleshooting and test services for broadcasters. Wood was recently in Sioux Falls, S.D., working on a 2,010-foot television tower, but he spends much of his time working on the Madison Community Tower. It has three 12-foot-wide sides and has work platforms at 500, 700, 900 and 1,310 feet, each with room to walk around but with railings around the perimeters. For safety reasons, much of our time was spent taking in the views from the platform at 900 feet. It revealed views afforded primarily to pilots. Drainage swales in farm fields become clear, along with an orchard and rows of manure from the barns at UW-Madison. University Ridge, Hawks Landing and Pleasant View golf courses stand out while the runway at Middleton Airport to the north looks like a narrow road. Acres of farmland east and west of Highway M appear ripe for development, while the Beltline’s path snakes through the city. Mineral Point Road is clearly defined, but the state Capitol appears farther than you would think. The manicured campus of the Bishop O’Connor Center stands out, as does CUNA Mutual’s headquarters, jutting from the tree-covered West Side. Directly below our perch, the dangers of the tower are revealed. Concrete slabs that cover the roofs of the transmitter buildings on the ground are broken. Falling pieces of ice from the tower during the winter can create havoc at this Secret Place.